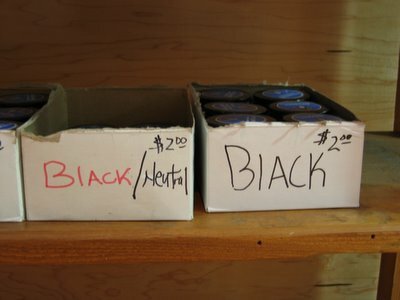 Found in the Good Footing Adventures shoe store on 7th Ave in Park Slope, these two boxes of BlACK shoe polish may be able to cover your scuffs, but they will also leave an indelible mark on the fabric of your delicate mind. I'm not sure how good this adventure will turn out to be, but the game is afoot for sure. And, this is the third time we've seen such a black and white case of lowercase L.
PS The word verification code for this comment was zmilf. erm, I meant punny! But I suppose puny will also do.